Dubray Tallman back with “Dubi meets the fans” and on this edition we have a double shot weekend with World League Wrestling from Richmond Missouri on April 23rd and April 24th from Concordia Missouri . We arrived at WLW on Friday afternoon and Brian tried to be cheap and save money on a motel room by looking around town, but the locals stated that they wouldn’t recommend anything but Super 8. Brian was on vacation so he back down from going elsewhere. When we checked in, the price for a Jacuzzi room with the best bathroom heater they had, it was not much difference and with our AAA membership we got 10% off…. So I had something to look forward to after the matches’ yay. When we got to the gym the place was buzzing as the small town of Richmond had come together to support young who was in need of a double lung transplant. A huge crowd was ready for wrestling and the place was filled with kids excited about the matches ahead. WLW had some new faces since we last had the chance to see them but our good friend Dan Gier was still there as well as Johnny Gold who it seems has been on his best behavior since he has not been leading his stable the Gold Exchange at WLW. Brian was busy talking WLW with Bill Smith and I was on the hunt to find fans for Dubi meets the fans. I caught up with Amy Hennig’s Superfan Frankie H from Richmond who jumped at the chance to be a part of this and have his picture with Amy. Brian has always been on the excited side for Amy since the first time we had seen her in Slater, MO. Her father was a wrestler who he grew up with. Brian could not get over how much more improved she has become throughout the year. Who wouldn’t want their picture taken with the Champ? 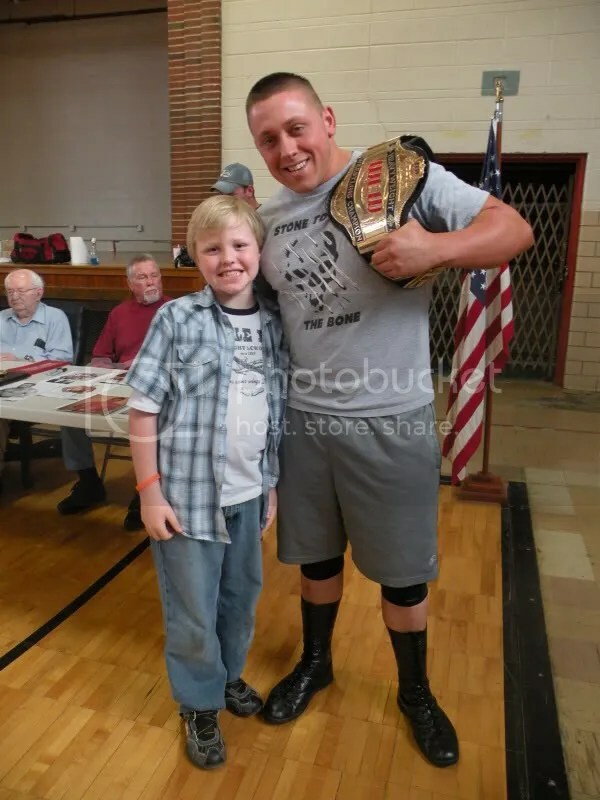 Mason Mathews would have to agree as he was all smiles when Trent Stone was kind enough to pose with him prior to his leather strap match with Trevor Murdoch. Speaking of Trevor’s, Trevor Murdoch would meet Masons brother Trevor Mathews from Hardin Missouri. Murdoch and Mathews would have fun doing the Murdoch signal together for the picture. Trevor Murdoch was very popular throughout the night and Richmond’s Alexander family of Shawn, Cassie, Trevon and Jordon all took a family pose with the talented Murdoch. It was my chance to choose a wrestler for my picture with a WLW star. I watched Eathon Wright show a lot of heart in his match with Mark Sterling so he won me over for the night. The next night we were at WLW in Concordia and while Brian was sweating thinking about what he was going to say in the Mark Sterling presentation for his award, I made my rounds for Dubi meets the WLW Fans in Concordia Missouri edition. I first caught up with another fans of Trevor Murdoch in Eric and Jazlynn Camerrer from Concordia Missouri. Keith Garrison was taking his friend Megan Olinger to wrestling for the very first time. They stated they were happy with anyone so that we could choose. I was happy to see another young star from WLW come up to meet the fans when the speedy Cancun Kid came to pose with Keith and Megan. I hope that Megan enjoyed the show. 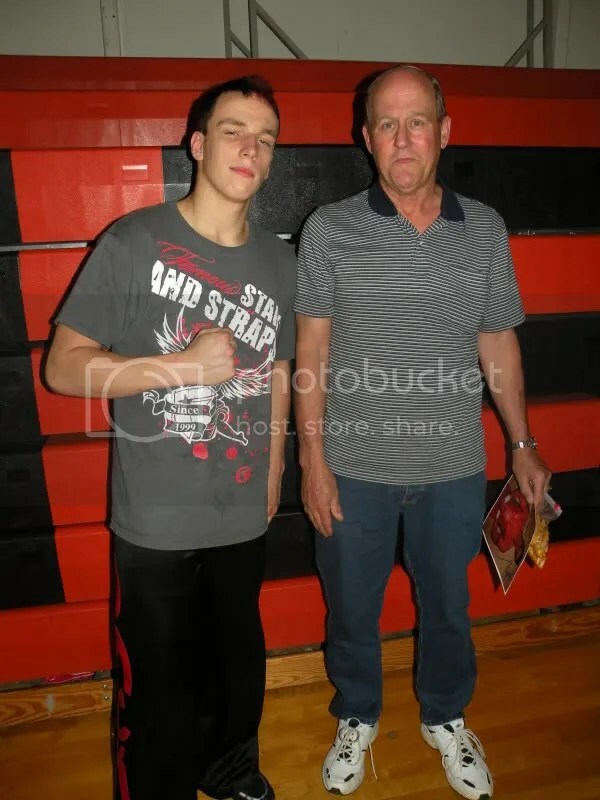 Standley Langkraehr has bought an 8×10 of another young wrestler and had chosen Jack Gamble to pose with him. For real guys I would like to thank the fans as well as the wrestlers for being part of this edition of Dubi meets the fans. This entry was posted on May 19, 2010 at 12:09 am	and is filed under Uncategorized. Tagged: Amy Hennig, Cancun Kid, Dubi meets the fans, Dubray Tallman, Eathon Wright, Harley Race, Jack Gamble, Johnny Gold, mark sterling, Missouri Wrestling Revival, Trent Stone, Trevor Murdoch, WLW, World League Wrestling. You can follow any responses to this entry through the RSS 2.0 feed. You can leave a response, or trackback from your own site.